The 2018 wildfire season was the deadliest and most destructive wildfire season on record in California, with a total of 8,527 fires burning an area of 1,893,913 acres (766,439 ha), the largest amount of burned acreage recorded in a fire season, according to the California Department of Forestry and Fire Protection (Cal Fire) and the National Interagency Fire Center (NIFC), as of December 21. The fires have caused more than $3.5 billion (2018 USD) in damages, including $1.792 billion in fire suppression costs. Through the end of August 2018, Cal Fire alone spent $432 million on operations. The Mendocino Complex Fire burned more than 459,000 acres (186,000 ha), becoming the largest complex fire in the state's history, with the complex's Ranch Fire surpassing the Thomas Fire and the Santiago Canyon Fire of 1889 to become California's single-largest recorded wildfire. In mid-July to August 2018, a series of large wildfires erupted across California, mostly in the northern part of the state, including the destructive Carr Fire and the Mendocino Complex Fire. On August 4, 2018, a national disaster was declared in Northern California, due to the extensive wildfires burning there. In November 2018, strong winds aggravated conditions in another round of large, destructive fires that occurred across the state. This new batch of wildfires includes the Woolsey Fire and the Camp Fire, the latter of which killed at least 86 people with 3 still unaccounted for as of 4 December 2018. It destroyed more than 18,000 structures, becoming both California's deadliest and most destructive wildfire on record. Many different factors led to the 2018 California wildfire season becoming so destructive. A combination of an increased amount of natural fuel and compounding atmospheric conditions linked to global warming led to a series of destructive fires. Recent research on wildfires in California, published in August 2018, predicted an increase in the number of wildfires as a consequence of climate change. Humans have been recorded as the main cause of wildfires in California. Various causes, both intentional and accidental, such as arson, unattended campfires, fireworks, cigarettes, cars, and power lines have contributed to this increase in the number of fires. Updating equipment, ensuring forest maintenance is being completed, and having oversight by state and federal governments are some of the mitigating actions that can reduce the risk of wildfires. A direct contributor to the 2018 California wildfires was an increase in dead tree fuel. By December 2017, there was a record 129 million dead trees in California. Stanford Earth System Science Professor Noah Diffenbaugh stated that atmospheric conditions for California wildfires are expected to worsen in the future because of the effects of climate change in California and that "what we're seeing over the last few years in terms of the wildfire season in California [is] very consistent with the historical trends in terms of increasing temperatures, increasing dryness, and increasing wildfire risk." Other experts agreed, saying that global warming is to blame for these extreme weather conditions. Global warming led to higher temperatures and less rain, creating a drier landscape that gave fires more fuel to burn longer and stronger. A wildland–urban interface (or WUI) refers to the zone of transition between unoccupied land and human development. Communities that are within 0.5 miles (0.80 km) of the zone may also be included. These lands and communities adjacent to and surrounded by wildlands are at risk of wildfires. Since the 1990s, over 43% of new residential buildings have been constructed in this area. In some areas, the amount of new residences in those areas is 80%. In the past, when these areas burned, no residences were lost, but now residences are present, which end up being destroyed. 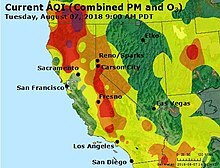 Northern California and the Central Valley saw drastic increases in air pollutants during the height of the July and August fires, while Southern California also experienced an increase in air pollution in August. 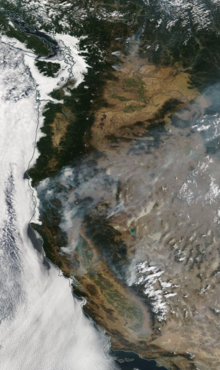 Air quality in Northern and Central California remained poor until mid-September 2018, when fire activity was drastically diminished. However, during the November Camp Fire, air quality diminished again, with the majority of the Bay being subjected to air quality indexes (AQIs) of 200 and above, in the "unhealthy" region. The following is a list of fires that burned more than 1,000 acres (400 ha), or produced significant structural damage or loss of life. On June 4, the Panoche Fire broke out, in a series of three blazes that started in the San Benito County area. While the Panoche incident was the smallest of the three fires, burning only 64 acres (26 ha), the remains of three people were found in a destroyed camping trailer in the burn area. The remains were believed to belong to a mother, a toddler, and an infant. On July 14, a Cal Fire bulldozer operator was killed while fighting the Ferguson Fire, becoming the first firefighter death of the season. On July 23, the Carr Fire broke out after a vehicle malfunctioned. While the Carr Fire burned in rural areas of Shasta County for the first few days, it crossed the Sacramento River and entered the city limits of Redding, California on the evening of July 26. By the next morning, two firefighters and four civilians had been killed. On July 29, a firefighter with the National Park Service was killed after a dead tree fell and struck him, while he was fighting the Ferguson Fire. He was "treated on scene, but died before he could be taken to the hospital". On August 4, a Pacific Gas and Electric Company employee was killed in a vehicle incident while working to restore services to areas impacted by the Carr Fire. On August 9, a Cal Fire heavy equipment mechanic was killed in a traffic incident while working at the Carr Fire. On August 13, a firefighter was killed while fighting the Mendocino Complex Fire. On November 8, 2018, at least 88 civilians were killed by the Camp Fire, while three firefighters were injured, the fire also destroyed more than 10,321 structures, becoming the deadliest and most destructive fire in California history. Three people also died during the Woolsey Fire near Malibu. The number dead was lowered to 85 by early December when it was discovered one victim was put in several bags. Photograph of smoky sky near sunset in early August looking toward the west, in Sacramento, California. The smoke was produced by the wildfires. California National Guard battles wildfires. The Bay Bridge in San Francisco, California. The photo on the left was taken November 16, 2018 and the one on the right October 14, 2018. ^ a b "2018 Fire Statistics". CAL FIRE. November 4, 2018. Retrieved November 9, 2018. ^ a b "2018 National Year-to-Date Report on Fires and Acres Burned" (PDF). NIFC. November 9, 2018. Retrieved November 9, 2018. ^ a b "Southern Area Coordination Center". Southern Area Coordination Center. Retrieved July 7, 2018. ^ a b c d e "2018 National Large Incident Year-to-Date Report" (PDF). National Interagency Fire Center. November 9, 2018. Retrieved November 9, 2018. ^ a b Jergler, Don (August 2, 2018). "Carr Fire Losses May Reach $1.5B in Likely Another Destructive Season for California". Insurance Journal. Retrieved August 29, 2018. ^ a b Siler, Wes (August 17, 2018). "The Economic Impact of Yosemite's Ferguson Fire". Outside Online. Retrieved August 29, 2018. ^ a b Beausang, Hannah (September 6, 2018). "Mendocino Complex wildfires cause $56 million of insured losses". North Bay Business Journal. Retrieved September 11, 2018. ^ a b c d "Woman, toddler, infant found dead at Central California wildfire scene". Los Angeles Times. June 5, 2018. Retrieved July 5, 2018. ^ a b c "Services set in Modesto for Cal Fire bulldozer operator killed fighting Ferguson fire". The Modesto Bee. Retrieved July 22, 2018. ^ a b "Two Missing Kids, Great-Grandmother in Redding Found Dead: Family". NBC Bay Area. Retrieved July 28, 2018. ^ a b "Carr Fire kills two firefighters near Redding, destroys 500 structures". San Francisco Chronicle. Retrieved July 28, 2018. ^ a b "Second firefighter killed fighting Ferguson Fire, officials confirm". Fresno Bee. Retrieved July 29, 2018. ^ a b "PG&E employee becomes seventh Carr Fire fatality". Redding Record Searchlight. Retrieved August 5, 2018. ^ a b Browning, Kellen (August 9, 2018). "Eighth person dies in relation to Carr Fire". The Sacramento Bee. Retrieved August 9, 2018. ^ a b "Mendocino Complex Press Conference" (PDF). Retrieved August 14, 2018. ^ a b c d e Nugent, Ciara (December 4, 2018). "Camp Fire Death Toll Lowered After Human Remains Were Mistakenly Sorted into Separate Bags". Time. Retrieved December 4, 2018. ^ Berger, Noah; Elias, Paul (September 7, 2018). "California takes financial wallop from unrelenting wildfires". Associated Press. Retrieved September 8, 2018. ^ "California wildfire declared 'largest in state's history'". BBC News. August 7, 2018. Retrieved August 7, 2018. ^ a b "Ranch Fire". CAL FIRE. August 28, 2018. Retrieved August 29, 2018. ^ "Governor Brown Announces Federal Approval of Presidential Major Disaster Declaration for Shasta County". Governor Edmund G. Brown Jr. Retrieved August 5, 2018. ^ "Assessing Extreme Weather‐Related Vulnerability and Identifying Resilience Options for California's Interdependent Transportation Fuel Sector" (PDF). University of California, Berkeley Center for Catastrophic Risk Management. August 2018. Retrieved November 11, 2018. ^ "Ferguson Fire: Tree mortality epidemic adding to fire crews' headaches". San Francisco Chronicle. July 26, 2018. Retrieved August 7, 2018. ^ "Record 129 Million Dead Trees in California" (PDF). United States Forest Service. July 1, 2018. Retrieved July 3, 2018. ^ "California wildfires will get worse in the future because of climate change, experts say". The Independent. Retrieved August 1, 2018. ^ "Rapid growth of the US wildland-urban interface raises wildfire risk". PNAS. March 27, 2018. Retrieved August 7, 2018. ^ "Wildfire, Wildlands, and People: Understanding and Preparing for Wildfire in the Wildland-Urban Interface" (PDF). United States Department of Agriculture Forest Service. January 2013. Retrieved August 7, 2018. ^ Phillips, Ari. "We're Building Millions of Homes in the Line of Wildfires". Gizmodo. Retrieved November 9, 2018. ^ "California Air Quality". Air Now. August 7, 2018. Retrieved August 7, 2018. ^ "Pleasant Fire". CAL FIRE. Retrieved February 18, 2018. ^ "Moffat Fire". CAL FIRE. Retrieved April 20, 2018. ^ "Nees Fire". CAL FIRE. Retrieved May 2, 2018. ^ "Patterson Fire". CAL FIRE. Retrieved May 17, 2018. ^ "Panoche Fire". CAL FIRE. June 7, 2018. Retrieved August 3, 2018. ^ "Apple Fire". National Wildfire Coordinating Group. June 13, 2018. Retrieved July 5, 2018. ^ "Airline Fire". CAL FIRE. June 14, 2018. Retrieved July 5, 2018. ^ "Apple Fire". CAL FIRE. June 14, 2018. Retrieved July 5, 2018. ^ "Chrome Fire". CAL FIRE. June 21, 2018. Retrieved July 5, 2018. ^ "Lions Fire". National Wildfire Coordinating Group. October 1, 2018. Retrieved October 2, 2018. ^ "Lions Fire". CAL FIRE. June 26, 2018. Retrieved July 7, 2018. ^ "Planada Fire". CAL FIRE. June 21, 2018. Retrieved July 5, 2018. ^ "Yankee Fire". CAL FIRE. July 1, 2018. Retrieved July 5, 2018. ^ "Lane Fire". CAL FIRE. June 27, 2018. Retrieved July 5, 2018. ^ "Pawnee Fire". CAL FIRE. July 8, 2018. Retrieved July 9, 2018. ^ "Creek Fire". CAL FIRE. July 4, 2018. Retrieved July 5, 2018. ^ "Waverly Fire". CAL FIRE. July 2, 2018. Retrieved July 4, 2018. ^ "County Fire". CAL FIRE. July 14, 2018. Retrieved July 15, 2018. ^ "Klamathon Fire". CAL FIRE. July 14, 2018. Retrieved July 14, 2018. ^ Browning, Kellen; Brown, Daniel (July 6, 2018). "At least one dead as Klamathon Fire tops 9,600 acres, remains state of emergency". The Sacramento Bee. Retrieved July 7, 2018. ^ "Valley Fire Information". National Wildfire Coordinating Group. October 22, 2018. Retrieved October 23, 2018. ^ "Valley Fire". CAL FIRE. October 22, 2018. Retrieved October 23, 2018. ^ "Holiday Fire". CAL FIRE. July 13, 2018. Retrieved July 13, 2018. ^ Nguyen, Alexander (July 7, 2018). "2 Fires Burning at Camp Pendleton; 750 Homes Evacuated". NBC Southern California. Retrieved July 7, 2018. ^ Wheeler, Brytani (July 11, 2018). "3rd MAW supports firefighting operations at Camp Pendleton". Marines. Retrieved July 13, 2018. ^ "West Fire". CAL FIRE. July 11, 2018. Retrieved July 12, 2018. ^ "Georges Fire". CAL FIRE. September 4, 2018. Retrieved September 13, 2018. ^ "Georges Fire". National Wildfire Coordinating Group. August 24, 2018. Retrieved September 13, 2018. ^ "Ferguson Fire". National Wildfire Coordinating Group. September 19, 2018. Retrieved October 2, 2018. ^ "Eagle Fire". National Wildfire Coordinating Group. July 15, 2018. Retrieved July 16, 2018. ^ "Natchez Fire". National Wildfire Coordinating Group. October 7, 2018. Retrieved October 30, 2018. ^ "Natchez Fire". CAL FIRE. October 30, 2018. Retrieved November 8, 2018. ^ "Carr Fire". CAL FIRE. August 30, 2018. Retrieved August 31, 2018. ^ "Cranston Fire". National Wildfire Coordinating Group. July 26, 2018. Retrieved July 26, 2018. ^ "Mendocino Complex Information". National Wildfire Coordinating Group. September 19, 2018. Retrieved September 20, 2018. ^ "River Fire". CAL FIRE. August 16, 2018. Retrieved August 16, 2018. ^ Driscoll, Curtis (July 28, 2018). "Cal Fire renames River and Ranch fires the Mendocino Complex Fire". Ukiah Daily Journal. Retrieved July 28, 2018. ^ "Whaleback Fire". National Wildfire Coordinating Group. July 28, 2018. Retrieved July 28, 2018. ^ "Butte Fire". CAL FIRE. August 3, 2018. Retrieved August 3, 2018. ^ "Donnell Fire: Incident information". National Wildfire Coordinating Group. October 1, 2018. Retrieved October 2, 2018. ^ "Tarina Fire". CAL FIRE. August 3, 2018. Retrieved August 3, 2018. ^ "1,000-acre brush fire at Camp Pendleton fully contained". CBS 8. Retrieved August 6, 2018. ^ "Turkey Fire". National Wildfire Coordinating Group. Retrieved August 7, 2018. ^ Vives, Ruben; Nelson, Laura J.; Smith, Doug (August 12, 2018). "Firefighters gain upper hand on 22,700-acre Holy fire in Cleveland National Forest, as containment rises to 41%". Los Angeles Times. Retrieved August 27, 2018. ^ "Holy Fire". National Wildfire Coordinating Group. September 14, 2018. Retrieved September 15, 2018. ^ "Holy Fire". CAL FIRE. August 26, 2018. Retrieved August 26, 2018. ^ "Holy Fire Reignites, Burns 150 Acres". CBS Los Angeles. August 28, 2018. Retrieved August 29, 2018. ^ "Five Fire General Information". CAL FIRE. August 8, 2018. Retrieved August 13, 2018. ^ "Hirz Fire". National Wildfire Coordinating Group. September 12, 2018. Retrieved September 13, 2018. ^ "Hat Fire". CAL FIRE. August 16, 2018. Retrieved August 16, 2018. ^ "Nelson Fire". National Wildfire Coordinating Group. Retrieved August 12, 2018. ^ "Stone Fire". National Wildfire Coordinating Group. August 29, 2018. Retrieved August 30, 2018. ^ "Mill Creek 1 Fire". National Wildfire Coordinating Group. August 30, 2018. Retrieved August 31, 2018. ^ "Front Fire". National Wildfire Coordinating Group. August 29, 2018. Retrieved September 2, 2018. ^ "North Fire". National Wildfire Coordinating Group. September 16, 2018. Retrieved September 16, 2018. ^ "Boot Fire". National Wildfire Coordinating Group. September 15, 2018. Retrieved September 16, 2018. ^ "Kerlin Fire". National Wildfire Coordinating Group. September 17, 2018. Retrieved September 17, 2018. ^ "Delta Fire". National Wildfire Coordinating Group. October 7, 2018. Retrieved October 7, 2018. ^ "Snell Fire". CAL FIRE. September 15, 2018. Retrieved September 16, 2018. ^ "Charlie Fire". CAL FIRE. September 25, 2018. Retrieved September 25, 2018. ^ "Charlie Fire Incident Information". National Wildfire Coordinating Group. October 1, 2018. Retrieved October 2, 2018. ^ "Alder, Mountaineer, and Moses Fires". National Wildfire Coordinating Group. November 9, 2018. Retrieved November 10, 2018. ^ "Two Fires Start to Grow in Remote Areas of Sequoia National Park". National Wildfire Coordinating Group. November 21, 2018. Retrieved November 23, 2018. ^ "Eden Fire". National Wildfire Coordinating Group. November 24, 2018. Retrieved November 24, 2018. ^ "Branscombe Fire". CAL FIRE. November 9, 2018. Retrieved November 9, 2018. ^ Hiland, Susan (October 9, 2018). "Branscombe Fire continues to burn through Suisun Marsh". Fairfield Daily Republic. Retrieved October 10, 2018. ^ "Sun Fire". CAL FIRE. October 12, 2018. Retrieved October 12, 2018. ^ "Alder, Mountaineer, and Moses Fires". National Wildfire Coordinating Group. November 9, 2018. Retrieved November 15, 2018. ^ "Incident Information CAMP FIRE". Cal Fire. Retrieved November 22, 2018. ^ "Five firefighters among dozen-plus patients burned in Camp Fire". ^ "Nurse Fire". CAL FIRE. November 9, 2018. Retrieved November 9, 2018. ^ "Hill Fire". CAL FIRE. November 11, 2018. Retrieved November 11, 2018. ^ "Woolsey Fire". CAL FIRE. November 11, 2018. Retrieved November 22, 2018. 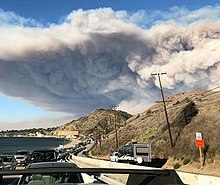 ^ "Woolsey Fire". Twitter. November 8, 2018. Retrieved November 8, 2018. ^ Gomez, Mark (June 5, 2018). "Three discovered dead in San Benito County wildfire". The Mercury News. Retrieved June 5, 2018. ^ Larson, Amy (June 5, 2018). "Mother, baby, toddler killed in San Benito County wildfire". KSBW. Retrieved June 5, 2018. ^ "Carr Fire death toll climbs to six as crews 'gain some ground' against massive blaze". The Washington Post. Retrieved July 29, 2018. ^ "Camp Fire death toll hits 71 on eve of Trump's visit to California". November 16, 2018 – via www.sacbee .com. ^ Cain, Josh; Gonzales, Ruby (November 14, 2018). "Woolsey fire death toll increases to 3, man's body found in charred Agoura Hills home". The Mercury News. Retrieved November 18, 2018. ^ Brodkin, Jon (August 21, 2018). "Verizon throttled fire department's "unlimited" data during Calif. wildfire". Ars Technica. Retrieved August 24, 2018. ^ Brodkin, Jon (August 22, 2018). "Fire dept. rejects Verizon's 'customer support mistake' excuse for throttling". Ars Technica. Retrieved August 24, 2018. Wikimedia Commons has media related to 2018 wildfires in California.